When Jeni and Ray got married, Jeni was 19, and didn’t want children. She was dismayed to find that her new husband, who had proposed marriage after 2 weeks of dating, wanted six kids. 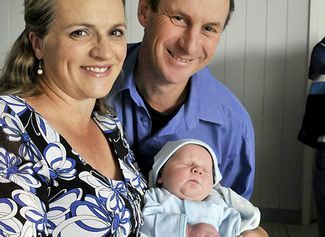 Fast-forward 22 years, and Jeni and Ray Bonnell have recently welcomed their new baby, Damian Ronald, into their life. Damian Bonnell was born in Toowoomba, Queensland, on Saturday June 4 2011 at 6.50 am, weighing in at 8 pounds 11 ounces, or just under 4 kg. 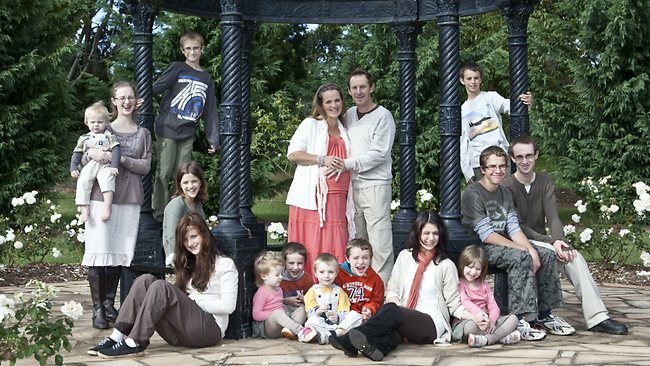 Damian is the fifteenth child born to Jeni and Ray, making them the largest nuclear family in Australia. Jeni describes their family life as “loving” and “happily chaotic”, but much like everyone else’s, just with extra washing to do. Oh, and they drive their own bus. Other than that, it’s a normal routine of school, homework and chores, with church and a roast dinner on Sundays. Damian’s brothers and sisters are Jesse (21), Brooke (20), Claire (17), Natalie (15), Karl (14), Samuel (12), Cameron (11), Sabrina (9), Timothy (8), Brandon (6), Eve (5), Nate (3), Rachel (2), and Eric (1). Jesse and Brooke have moved out of home, but you can tell what a close family it is, because both of them bought houses right near their childhood home. I know name collectors often say they would need to have more than a dozen children to use all their favourite names, so, er – here’s a chance to see what your life would look like if that happened! When I see other families with lots of children, I’ve noticed that they often stick with an obvious theme to help choose baby names, such as all the names starting with the same letter, or all of them being from the Bible. Sometimes you can see that invention begins to run out, so that the first children have fairly standard names like Andrew and Emily, and then the names get steadily more random, so that the last ones are called Bobo, Hex and Glass or something. Another naming issue for large families is that almost an entire generation can separate the first-born from the last-born, and if you always choose popular names, you’ll end up with your eldest children being called Darren and Brittany, and your youngest being called Kai and Sienna – total naming mis-match. This is something I see a lot, actually – it’s a dilemma for parents who have children in their early 20s, then have a couple more in their late 30s, because fashions in naming change the meantime. I think that in general the Bonnells have avoided many of these pitfalls, and they certainly don’t seem to have had any problems running out of ideas for names. Which is a good thing, because the Bonnells say they would love to have more children! Wow, that is….. a lot of kids! They look like such a happy family, so that’s really nice. And yes, the mum looks great! I’m not really a fan of most of the names they chose (I like Jesse, Eve and Nate but not so much the others), but it’s their family and the names do go pretty well together. Neat! I absolutely love large families. And they have beautiful name choices. My favorites are Jesse, Timothy, Rachel, and Eric (Rachel, Eric, and Timothy are all on my top 10 lists!). Love this post 🙂 15 kids what a name nerds dream and doesn’t the Mum look fab! Anyway, I quite like the sibset in this article. All the names are fairly common but still interesting, and they are all individual. I can’t stand it when there’s a huge family with an obvious and restrictive naming theme. I must confess, I just looked at the popularity charts for 1989 and 2010, and picked a boy and a girl from each without really thinking – but Sienna IS a very popular name now, and I don’t really remember ever hearing it until the early 2000s. But actress Sienna Miller is only a few years older than you, so obviously it was around in the 1980s too. Yes, I think your parents must have been good at picking winners! What I like about the Bonnells’ names is that it seems like a “normal” sibset – just bigger than usual! And that’s refreshing for a big family.